Called “popiah chee” in Penang Hokkien, or literally “fried popiah” or fried spring rolls, these crispy appetizer is stuffed with fillings made of shredded jicama/yam bean, carrots, shrimp, or pork. Other ingredients such diced bean curds (firm tofu), mushrooms, and french beans can be added. The ingredients used are quite versatile, but there is one thing that’s often served with spring rolls or fried popiah–chili sauce. The spicy, sweet, salty, and garlicky chili sauce is great as a dipping sauce and fires up the palate for more servings of spring rolls. I personally love Nyonya popiah, more so than any other variations offered. 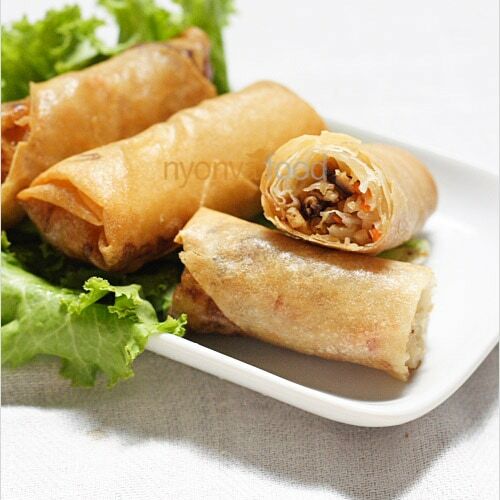 Spring Rolls Recipe (Fried Popiah Recipe) | Easy Delicious Recipes: Rasa Malaysia. In a wok, heat up cooking oil. Add in garlic and stir-fry until aromatic. Add in chicken, shrimps, and mushrooms and continue to stir-fry until cooked. Add in yam bean, carrot, and stir-fry for 1-2 minutes, add in 1cup of water, cover up with lid and simmer for 15-20 minutes until vegetables are tender. Add in seasoning ingredients and mix well. Dish out and set aside. Place a piece of spring roll wrapper. Top up 2 spoonfuls of the fillings on the wrapper and then fold in the two sides and roll up. Using flour mixture to seal up the edges. Heat up wok, pour in 2 cups of cooking oil. Deep fry the spring rolls until golden brown and crispy with medium heat. Dish out and drain with paper towels. Serve hot with chili sauce.